This Chopper is for YOU! western Maine, New Hampshire and surrounding areas. 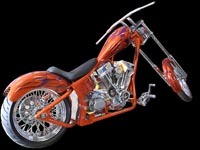 specializes in Harley Davidson V-Twin motorcycle parts and service as well as snowmobile and ATV parts and service. Located on Hide-A-Way Lane off of Chandler Hill road in Bethel, Maine, this shop is able to service the increasing number of motorcyclist living and traveling in this area. Although Harley Davidson motorcycles are our prime interest, we serve customers of other brands needing parts or service as well. Two avid motorcyclists seeing a need for accessories and service in the area originally founded the Norsemen Cycle Shop in Berlin, NH in 1988. Over the years, the name has become well-known, building a steady customer clientele from as far away as Lewiston, ME. After relocating to Bethel, Maine the shop has been to serving customers from Colebrook, NH, Lewiston, ME, Fryeburg, ME, and into Vermont. Jim Bennett, owner, has worked with V-Twins for many years as well as many other styles and brands of bikes, ATV’s and Snowmobiles. Jim works with his customers and is easy to get along with.